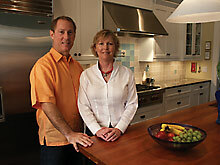 We are Chuck and Susan Dawson, owners of Silver Palm Custom Homes and Remodeling. We have been remodeling and building homes for ourselves during our 21 years of marriage. Because we are the client and the building contractor, we see the construction process from both perspectives. This insight allows us to offer a unique product for our clients. We have the passion that our client has with the wisdom to focus on what is truly essential for each project. That comes from asking the client what features they want and the benefits that they are expecting. My wife Susan focuses on what she calls “Simple Elegance” with her interior decorating, “Simply Susan”. I am a licensed Building Contractor in the state of Florida and Certified Remodeler. Florida has one of the nation’s most stringent licensing requirements and my NARI Certification is one of the top accreditations in the industry. I am proud of my membership with NARI and the positive things that it does for both the industry and the community. As a liaison with the local High Schools, I participate in teacher advisory panels and presentations to students and their parents in the construction vocation programs. I’m currently a board member and 2nd VP of our local NARI of Tampa Bay Chapter. Our other interests are participation with Rotary International and sailing with the St. Petersburg Yacht Club events.